Can the South handle the influx of 'returnees' who've come back to live in a new, free nation? 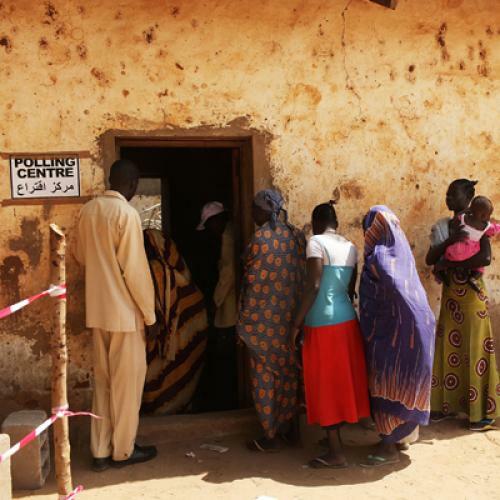 Bentiu, Sudan—In the center of this southern town, in a dusty public square with just a few trees for precious shade, 19 busloads of people arrived from Khartoum on Sunday, the first day of voting in this week’s historic referendum for independence. They were just a fraction of the 36,800 “returnees” that officials estimate have flooded into Unity state, of which Bentiu is the capital city, over the past two months. These returnees—which some here expect could eventually top 100,000—are people who fled Unity state during years of bloody, costly war, but who have traveled back because they want to live in a new, free South Sudan. The mass arrival of returnees has created enormous logistical challenges—challenges that those desperate to re-settle in their homeland have tried to surmount and that southern authorities have tried to minimize. But have these efforts been enough? It is an important question, because such a large movement of people can pose health and other humanitarian problems. The southern government has paid for many buses and trucks to bring people from Khartoum, and those returnees who officially registered with this program have been able to travel for free. But the government’s transport capacity has not come close to meeting the demand, so many people have paid their own way, cobbling together their meager savings for fares ranging from 300 to 1,000 Sudanese pounds (roughly $100 to $350) per person. According to the International Organization on Migration, at least 40 percent of those who have returned to the south so far have done so through their own means. Most of those I spoke to said that, on a bus journey of three to six days, they had nothing to eat. Their first meal was thanks to one of the many World Food Program distribution points set up across the south to give rations of sorghum, salt, oil, and legumes to the returnees. Once the returnees finish their journey, they face new hurdles. “We are trying to arrange accommodation for them in the schools,” says Michael Bateah, acting director of the Southern Sudan Relief and Rehabilitation Commission (SSRRC) in Bentiu. Looking at crowds of people who arrived with all of their worldly possessions and now huddle under trees in the town square, Bateah explained why, in addition to space constraints, it has been hard to house the returnees. “Unfortunately, people are mostly reluctant to leave their luggage,” he explains. Food also continues to be a problem. Standing in a group of people all pushing to present their ration cards, given out by local authorities, Elizabeth Nyapua, says she is worried that the rations will come to an end and she won’t be able to feed herself and her three children, who made the return journey with her. “But for sure something will work out. This is my homeland. This is the land of my grandparents,” she says hopefully. The sentiment is a common one: Every returnee I spoke with, from children to the very old, expressed faith that, because they were now back in the place they consider home, somehow, things would work out. And many of them have faced far worse, both during the war years and, in some cases, after they fled. In Bentiu’s public square, 27-year-old Mary Nyariek Tekjiak lay on a bed frame, with her two-year-old daughter asleep at the end under the shade of a makeshift tent Tekjiak had constructed with two sticks and a mattress. Tekjiak spent the majority of last year in jail in Khartoum for having brewed marissa, a traditional southern drink whose alcoholic properties fall afoul of the north’s sharia law. For many southern women who are now displaced in Sudan’s capital, pervasive discrimination and a lack of education make it impossible to get work, so brewing marissa ends up being the only way they can make enough money to feed their children. In comparison to these challenges, the struggles of coming home seem small—or, at least, worth enduring without complaint. “Even if there is not enough food in the south, we are proud to be in our homeland,” Tekjiak says.